Playing social games doesn't have to mean clicking on a farm. In Dungeon Rampage's case, social means wading into hordes of enemies and traversing perilous dungeons side-by-side with other people; you know — old school social, the way your mother used to make it. Oh the things I've missed while poking about FarmVille and CityVille 2. I could have been wandering about dungeons with random people, collecting gold and experience and unlocking additional classes while tearing my way through the evil Lord Dinglepus' Dungeon Games. 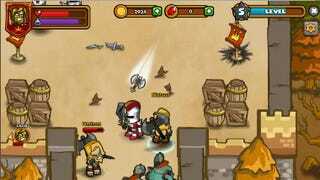 Dungeon Rampage plays a whole lot like those four-player arcade action role-playing games of old. Arrow keys to move, Z-X-C keys for weapons, smashing barrels to find random food — it's good times, and it's completely free-to-play, unless you really need premium items, and then that's on you. Also, they have Vorpal Bunnies. Best of all, you never even have to touch Facebook. Dungeon Rampage can be played on Kongregate or directly from your web browser. Did I mention the bunnies?